Ireland’s Cosmo Pharma claimed FDA approval for its traveller’s diarrhoea drug Aemcolo, which some analysts say could be a big threat to a rival drug sold by Bausch Health’s Salix unit. The US regulator cleared Aemcolo (rifamycin) for the treatment of adults with travellers’ diarrhoea caused by non-invasive strains of Escherichia coli not complicated by fever or blood in the stool, a condition which afflict millions of people around the world each year. Aemcolo’s approval is based on a clinical trial in 264 travellers to Guatemala and Mexico who developed diarrhoea and were treated with the drug taken orally over three or four days or a matched placebo. The results showed that Aemcolo significantly reduced symptoms compared to control. The approval sets Cosmo in competition with Salix’ rival diarrhoea therapy Xifaxan (rifamixin), which isn’t approved to treat travellers’ diarrhoea but nevertheless is widely prescribed off-label to treat and sometimes also prevent the condition. Meanwhile, Cosmo is also gunning after Salix’ main approved indication for Xifaxan – inflammatory bowel syndrome (IBS) with diarrhoea (IBS-D) – starting a phase II programme with rifamycin earlier this year. Cosmo is testing both two- and three-doses per day for Aemcolo in IBS-D and, if it can show activity with the less frequent dosing, it could mount a major challenge to Xifaxan, which needs three doses a day. However, Deutsche Bank analyst Gregg Gilbert has suggested that physicians may start to prescribe Aemcolo off-label for IBS-D once it becomes available. That could be a problem for Salix and parent Bausch Health (formerly Valeant), as Xifaxan accounted for two-thirds of Salix’ turnover of $460 million in the third quarter, and 15% of Bausch Health’s product sales. 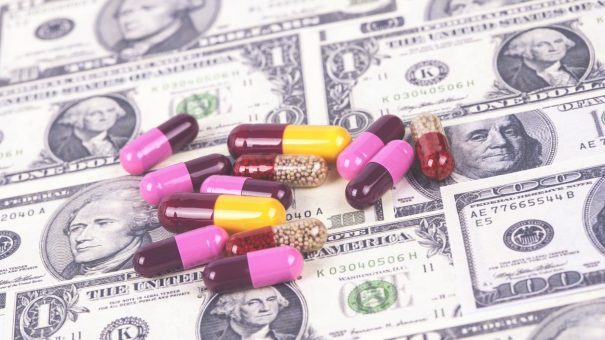 The company has been able to fend off would-be generic competitors to its cash cow, recently agreeing a deal with Allergan/Actavis that will delay its version of the drug until 2028. Off-label use of Aemcolo in IBS-D could however pose another, under-appreciated threat to the drug, according to Deutsche Bank. Bausch Health has been partnering with Cosmo on the Irish firm’s ulcerative colitis therapy Uceris (budesonide), but that relationship has turned sour. Cosmo has been trying to reclaim rights to the drug, which made $134 million in sales last year, claiming breach of license, manufacturing and supply agreement. The case went to arbitration which ruled against Cosmo in April, a couple of months before Teva launched a generic version of the drug in the US.